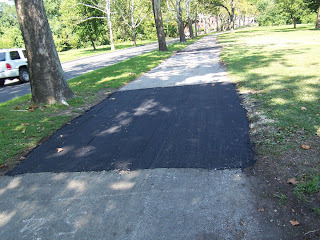 On Monday the Fairmount Park Commission Staff began repair work on the MLK Drive Path just south of Montgomery Drive. 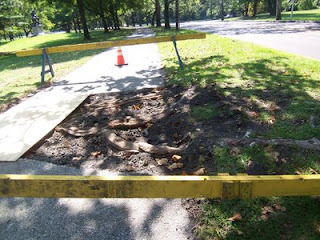 The roots of the old street trees along the green strip between the path and the road have caused the pavement to heave and has resulted in an umcomfortably bumpy ride, especially for those on road bikes. It looks like crews are doing a few tree root systems at a time. As of Wednesday the first set of repairs are complete with more segments dug out. The park arborists are taking care to minimize the damage to the trees.